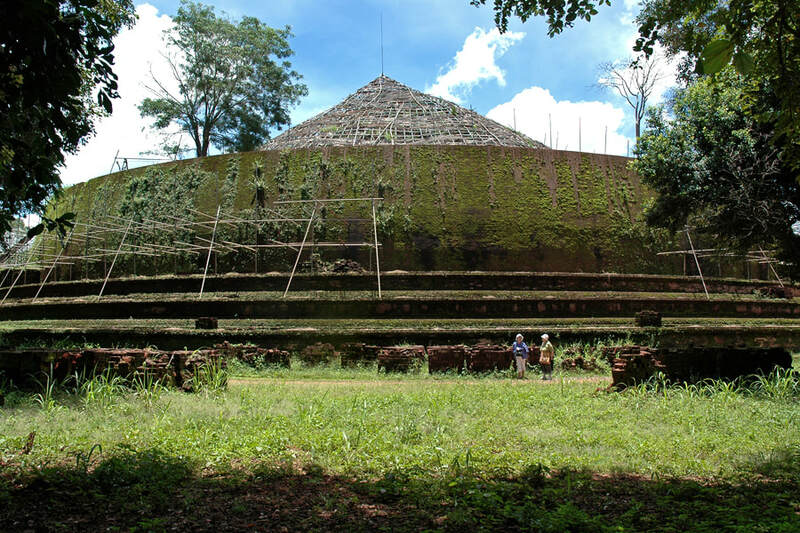 With a diameter of almost 100 m, the stupa of Yudaganawa near Buttala, known as Kinkini stupa by locals, is the largest in the south and in the east of Sri Lanka, the historical area known as Rohana in the chronicles. The giant stupa is a mystery, as a construction on such a large scale should be expected to be mentioned in the chronicles, but the Kinkini stupa of Yudaganawa has not yet been identified with a major project mentioned in the ancient chronicles. There are various theories, from which period this huge dagaba of Yudaganawa might be and what could have been its original form. 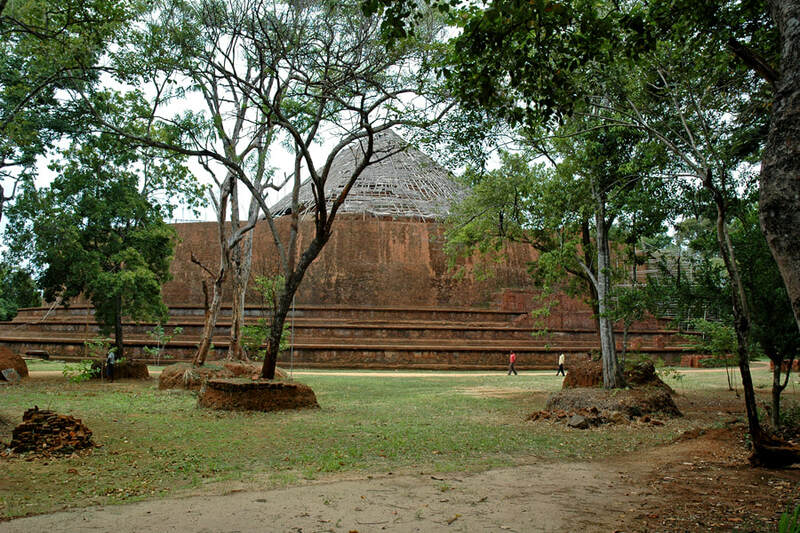 Most probably, the final stupa of Yudaganawa is from the Polonnaruwa period but had smaller sized predecessor structures from the Anuradhapura period. Kota Vehera type of stupa indicating Polonnaruwa period - yes or no? Due to its shape resembling a hemisphere cut in half horizontally, it seems likely that the Yudaganawa stupa was of the Kota Vehera type which became the typical form of giant stupas under King Parakramabahu (1153-86). This most significant monarch of the Polonnaruwa period constructed the similarly flat stupas Demala Mahaesaya in Polonnaruwa and the Kota Vehera in Dedigama. The latter was once his father’s residence and his own birthplace in the west of Sri Lanka. It’s likely that King Parakrambahu, one of the few Sri Lankan monarchs who controlled all major parts of the island, demonstrated his power and achievements in the southern part known as Ruhuna, too. Yudaganawa could mark the hometown of his mother, Ratnavali, who was from this area. Some believe Yudaganawa to be the spot where the king enshrined the ashes of his mother, as it is recorded in Verses 79,71-72 of the Mahavamsa chronicle, or more precisely: in its sequel sometimes called Chulavamsa. The Kota Vehera type, a stupa built only half way with a smaller stupa on its upper terrace, using the large construction as a shaft. Kota Vehera type stupas seem to be uncompleted, but this double-storey type could also have been the original construction plan. Smaller stupas in the Kota Vehera style are also known in Sri Lanka, for example the Lahugala Kota Vehera. "Recent archaeological excavations however have proved that this was not a Kota Vehera but at one time was a complete stupa"
Regrettably, this wikipedia article does not mention any source for this result of recent research. The articles's only references are a link to a map and the contradictory Yudaganawa article of the Department of Archaeology just mentioned above. Presumably, the wikipedia article on Yudaganawa refers to one of the very best websites available for those looking for comprehensive information about Sri Lanka’s heritage sites and other attractions, namely amazinglanka. "But according to the Dr. W.H. Wijepala, Director-General of Archaeology, the recent excavations have proved that this was a not a Kota Vehera but a complete stupa at one time." W.H. Wijepala was the head of the Department of Archaeology from 2001 till 2004. He is credited with having introduced modern methods of stupa excavation in Sri Lanka, when he was field director at the excavation of Deliwala Chaitya near Rambukkana in 2000. Local legends ascribe the stupa to the Sinhalese national hero Dutugemunu, known as Dutthagamani from the chronicles written in Pali language. Dutugemunu, who is said to have lost a battle here, lived in the 2nd century B.C. Another dating is to the 6th century, when Anuradhapura had lost control over the southern principalities of southeastern Sri Lanka. Local rulers from Rohana may have erected a large stupa to demonstrate their own souvereignty and to refer to Dutugemunu, who was born in southern Sri Lanka. It may well be the case that an earlier stupa already existed and was enlarged. This “growing size” of stupas is quite common in India’s architecture. In case the final stupa was built by King Parakramabahu the Great from Polonnaruwa, it could have been a further enlargement in the flat (or half-cut) style of Kota Vehera. The name Yudaganawa, also spelt Yudhaganawa or Yudaganava and ponounce like “Yoodegenaawe”, stressed on the second last syllable, is derived from the Sanskrit terms “Yuddha” for “war” and “gana” for “gathering” or “crowd” or “troop”. Thus, “Yudhaganawa” means “comming together for combat”. The toponym is a reminder of a battle. In Sinhala words, “gana”, derived from Sanskrit “ganay”, also means “count”. In this sense, “Yudhaganawa” can mean “tallying the troops”. The name of the village is sometimes abbreviated to Udagama. The Rajavaliya chronicle, composed in the Kandy period, has the name "Yudaganapitiya" for the place where Dutugemunu encountered the army of his younger brother Sadhatissa, who had refused to hand out the royal elephant Kandula after the passing away of their father, King Kavantissa of Rohana. Dutugemunu lost this battle in the war of brothers and had to flee, before being reconciled with his brother due to intervention of the Buddhist order. "Yudagana-pitiya" literally means "Yudaganawa-place". The toponym given in the 24th chapter of the Mahavamsa chronicle, which was written more than one millennium prior to the Rajavaliya, is "Culanganiyapitthi" or "Chulagani-pitiya". This older name of the battlefield is still in use, too, see below. In between A4 mainroad and the car park of the Yudaganawa stupa in Udagama is a small group of ancient brick structure called Chulangi Viharaya. 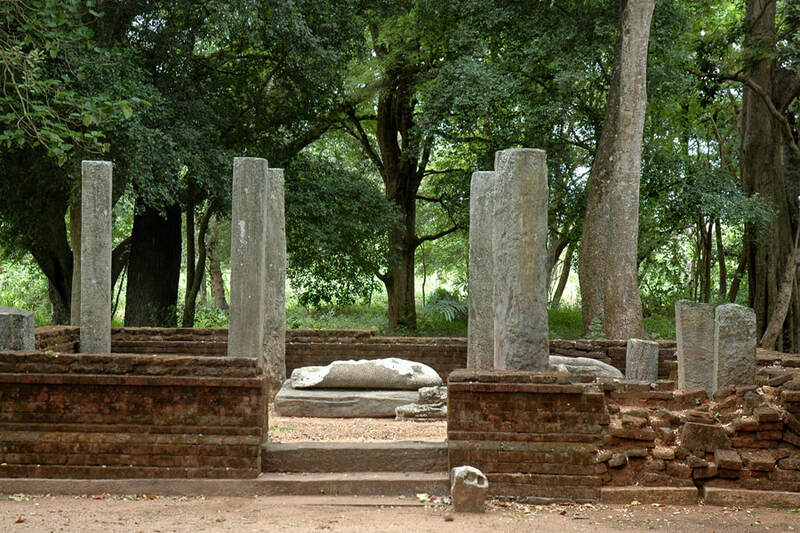 These are the remnants of the ceremonial core of an ancient monastery from the Polonnaruwa period (11th to 13th century). The buildings serving as monks’ dwellings have not survived, as they were built of perishable materials. The most eye-catching structure is a small stupa on an elevated platform with a cirumambulatory. The other buildings represent image houses called Pathimagara in Pali or Pilimage in Sinhala, halls for veneration of Buddha images. Scarce remnants of a Buddha a sculpture are still in situ. The Buddha sculptures found in Chulangani Viharaya are from the 6th or 7th century, the mid Anuradhapura period. During the Polonnaruwa period, it became quite common to erect new buildings for much older statues from earlier monuments that had fallen into decay. 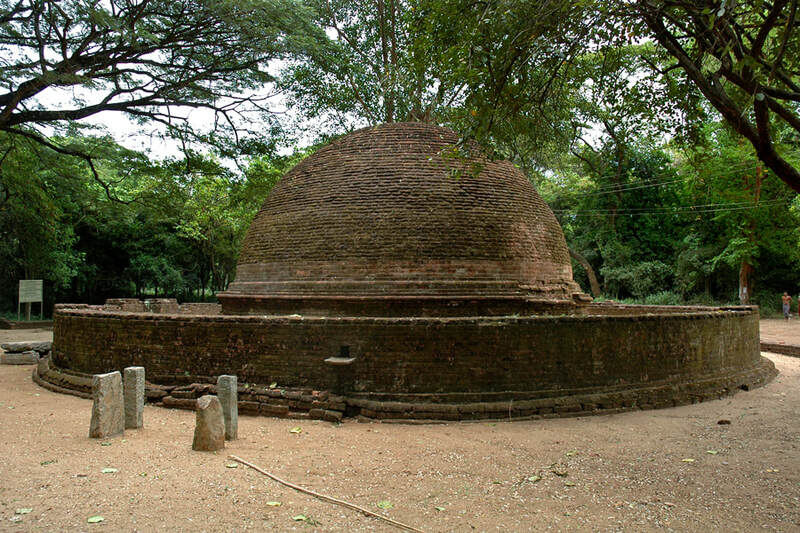 About 1 km to the west of Chulangani Viharaya is the Yudaganawa Wewa, a tank ascribed to King Mahasena from Anuradhapura, indeed it is from the Anuradhapura period. The tank is considered the best birdwatching place in the surroundings of Buttala.